FAIRFIELD — With the chance to manage the town’s skate park on the line, Day One Skate Shop is busy raising the funds it needs for liability insurance. Day One, which is now housed at 25 South Benson Road, was one of only two companies to bid on the park management. The second, Bridgeport-based Rampage Skates, withdrew its bid at the public opening. 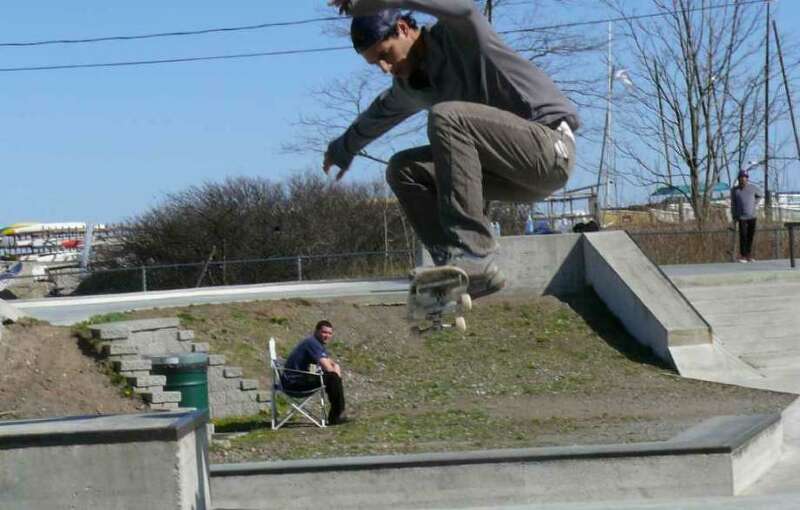 For managing the skate park, located at the South Benson Marina, Day One would pay $1,050 in 2018, $2,100 in 2019, and $2,020 in 2020. While the bid has been awarded, Recreation Director Anthony Calabrese, no agreement has been finalized or signed yet. The liability insurance policy would have to be in place by the time of the signing, he said. Having an outside company in charge of the skate park, which opened in 2009, is something new. “I was interested in finding out if there was any interested from a private company to come in, and pay us rent to manage the park, while also assuming the liability for the park,” Calabrese said. Since it opened, there has been no fee to the use the South Benson skate park. Under the contract, Day One could charge admission, but both Calabrese, and the gofundme page for the insurance, indicate the shop does not intend to impose any admission fees. In an interview, McCullough said the idea is to basically move the store to the skate park, and make money through offerings like private lessons, camps, and other events. “That’s where we can build off of any type of revenue stream,” he said. McCullough said they have received an insurance quote, and would need to pay the premium by Feb. 21. The contract is for three years, with two optional one-year renewal terms. The park would be required to be open from April 1 until after the Thanksgiving each weekend, from 10 a.m. to 6 p.m., with hours extended to 7 p.m. during the summer months. They are allowed to provide lessons, promotional events, and competitions, but cannot install any permanent structures. McCullough said he is currently looking at using a shipping container as the retail space, which he believes would meet the contract requirements.